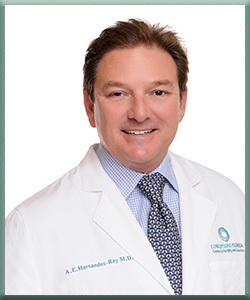 Armando Hernandez-Rey, MD is a board-certified reproductive endocrinology and infertility specialist. He specializes in treating patients with polycystic ovary syndrome (PCOS), recurrent pregnancy loss (miscarriage), and severe endometriosis. He is especially interested in fertility preservation (egg freezing) for patients who must delay childbearing for personal or medical reasons, including cancer and systemic lupus erythematosus. As one of only two fertility specialists offering robotic surgery in Miami, Dr. Hernandez-Rey is able to offer minimally invasive surgeries with faster recovery times and minimal scarring, often as an alternative to advanced treatments such as IVF. He has performed numerous tubal reanastomosis procedures (tubal ligation reversal), myomectomies (removal of fibroids), and surgery for severe cases of endometriosis for the management of infertility. Dr. Hernandez-Rey has made dreams come true for hundreds of families from South Florida and across the world. He prides himself on being accessible to his patients to ensure they are calm and reassured, a key component to his success. Both Dr. Hernandez-Rey and most of our professional staff also speak Spanish. Following his residency in obstetrics and gynecology at the University of Miami-Jackson Memorial Hospital, Dr. Hernandez-Rey completed a three-year fellowship in reproductive endocrinology and infertility at the UMDNJ School of Medicine. He holds three board certifications. He is certified by the American Board of Obstetrics and Gynecology in the subspecialty of reproductive endocrinology and infertility (REI), as well as OB/GYN and Surgery. Dr. Hernandez-Rey is an assistant clinical professor at the Herbert Wertheim College of Medicine at Florida International University and serves as an ad-hoc reviewer for the prestigious peer-reviewed journal, Fertility and Sterility. He has also published several articles and chapters in medical literature. 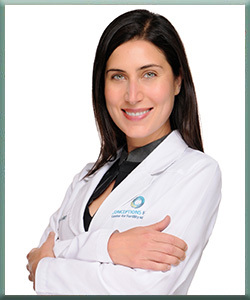 Dr. Sinem Karipcin is board certified in Reproductive Endocrinology and Infertility. She is an expert in all aspects of assisted reproductive technologies and reproductive surgery. Dr. Karipcin prides herself in helping patients understand their condition and helping them make informed decisions. She uses the most up-to-date, evidence based approaches in both ART and minimally invasive surgery for fertility disorders. Dr. Karipcin has a specific interest and expertise in personalized reproductive care through genomics as well as environmental impacts on fertility. She also specializes in egg freezing, IVF and fertility surgery. She manages conditions including endometriosis, recurrent pregnancy loss, diminished ovarian reserve and polycystic ovarian syndrome (PCOS), helping her patients to conceive and have a family. Dr. Karipcin completed her fellowship training in Reproductive Endocrinology and Infertility at the internationally renowned Cornell University Fertility Center. She completed her residency in Obstetrics and Gynecology at the University of Texas at Galveston. In addition to being an exceptional clinician, Dr. Karipcin has been in involved in innovative clinical research in endometriosis through a post doctoral fellowship at Yale University. She led a number of original studies to optimize IVF protocols at Harvard and Cornell. She published in the field’s foremost peer-reviewed journals and presented at national and international conferences. She has ongoing research in genetics at Conceptions Florida. Dr. Karipcin is a clinical Assistant Professor of Obstetrics and Gynecology at Florida International University. Dr. Karipcin is an active member of and reviewer for the American Society of Reproductive Medicine (ASRM), European Society of Human Reproduction and Embryology (ESHRE) and the Society of Reproductive Investigation. Dr. Karipcin is on staff at Baptist Hospital, South Miami Hospital, Mercy Hospital, Miami Medical Center, and Surgical Park. 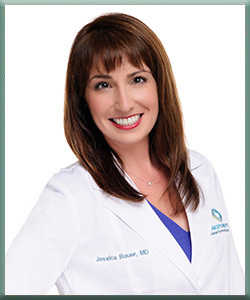 Dr. Jessica Bauer joined Conceptions Florida after completing her fellowship at the University of Colorado in Denver. Dr. Bauer was born and raised in Newton, Massachusetts. She attended Barnard College in NYC where she earned a BA in Neuroscience & Behavior. She has a Masters of Science in Nutrition from Columbia University. She received her medical degree from Tufts University in Boston and went on to complete her OBGYN residency at the Mount Sinai Beth Israel Hospital in NYC. Dr. Bauer's interests include fertility preservation (egg freezing) and reproductive surgery. She takes a holistic approach in order to offer women complete reproductive care. Dr. Bauer is a board-certified Ob-Gyn and is board eligible in Reproductive Endocrinology and Infertility. She is excited to be back on the east coast to join the Conceptions Florida family. 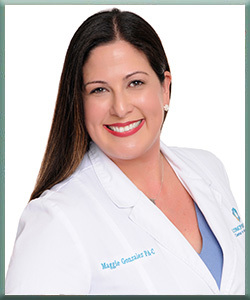 Maggie Gonzalez PA-C, MMS graduated from Nova Southeastern University PA Program in 2004 followed by a Trauma/General Surgery and Critical Care Residency at JMH/Ryder Trauma Center completed in 2005. She practiced as Chief Physician Assistant at Memorial Regional Hospital in Trauma/General Surgery and Critical Care for 11 years. Maggie is passionate about her involvement in the PA community and in the education of prospective healthcare professionals. She is actively involved in the Florida Academy of Physician Assistants, she serves as the Course Director for the Miami Dade College PA program’s Surgical Curriculum and is a frequent speaker on various surgical topics. She has been the recipient of the Lippincott Williams and Wilkins award for Outstanding Surgical Achievement and of the MDC PA Program Preceptor of the Year. She also holds multiple publications in prestigious medical journals including the Journal of Trauma and Acute Care Surgery. In 2016, Maggie joined Conceptions Florida where she is an integral part of the team, performing procedures and assisting in surgeries, and is beloved by our patients.